Show off your favorite produce with this recipe from our wonderful, talented friend Darshana Thacker, a chef who uses only whole-food, plant-based ingredients. 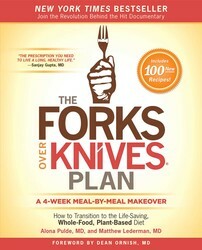 From The Forks Over Knives Plan: A 4-Week Meal-by-Meal Makeover. 1. Rinse the rice and place it in a saucepan with 2 cups water. Bring the water to a boil over high heat. Reduce the heat to low, cover, and simmer until the rice is tender, about 45 minutes. Remove the pan from the heat and let stand, covered, for 10 to 15 minutes. 2. Transfer the rice to a large bowl and let it cool for a few minutes until no longer steaming. Add the zucchini, cucumber, tomatoes, green onions, cilantro, 3 tablespoons lemon juice, pepper, and salt to taste. Mix well. Taste and add more lemon juice or salt if desired. Cover and chill or let stand at room temperature for 30 minutes to allow the juices from the vegetables and the lemon juice to mix with the rice so that all the flavors meld. Taste and adjust seasoning. 3. Serve cold or at room temperature. Store the salad in an airtight container in the refrigerator for 2 to 3 days.